Or, The Only Eagle I Ever Made On A Par 4. Tales From Dirt Mountain, Part 11. Oak trees can live as long as 400 years. They typically grow 50 to 70 feet tall, and will have extensive branching if they get sufficient light. Amid the pines, magnolias, and cedars, oaks are everywhere on Dirt Mountain. Live oaks, pin oaks, southern red oaks. In the fall, Earl and I would sometimes see Sasquatch, the albino squirrel, gathering acorns under an oak. Preparing for winter. The acorns were just starting to fall that September afternoon when the two of us were standing on the tee at the 6th hole. Earl was unusually quiet. This was the last round of golf we would play before I left for college. In the morning I would drive to Atlanta. After college, who knows where I would end up. Earl was destined to spend the rest of his life running the pro shop at Dirt Mountain. Someone had to take over when his father got too old. As it turned out, I moved back to Maynard County after college. Playing golf with Earl at Dirt Mountain would be one of the most consistent themes of my life. But we didn’t know it that crisp afternoon. He was happy I got that scholarship, and pissed off that I was leaving. Thus, the lack of banter that typically emanated from Big Earl Saunders. If you are not a golfer, you need to know something about eagles. We’re not talking about birds. An eagle is the score you get when you make a three on a par 5. Or, less often, a two on a par 4. Pros and top amateurs make a lot of eagles. I had made few enough to remember each one. And I’d never made one on a par 4. Number six is a short, uphill dogleg to the right. You could play it safe and hit a 3 iron in the fairway. That would leave you a short pitch to the green. Or, you could take on Becker’s Oak, and go for the green. The southern red oak guarded any direct assault on the green. It wasn’t that you couldn’t hit the ball far enough. 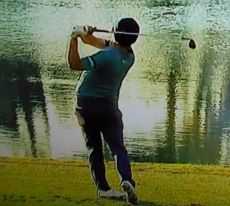 You had to hit a five wood high enough to get over the tree, but precisely enough to stop on the green. Over the green and you go down a hill into thick vegetation. Triple bogey territory. The story of Becker’s Oak is one of Earl’s many tall tales. I had no idea where he came up with that stuff. According to him, during the Civil war, Amos Becker was a private in the Confederate Army. Amos didn’t believe in quitting, so when the South surrendered, Amos went guerilla and continued to fight a one-man war. Earl claimed that Dirt Mountain was Becker’s hideout while this was going on. Whenever the authorities tried to find Becker, he would elude them by climbing up the oak tree that would one day guard the sixth hole. Approximately 100 years later, George Saunders, Earl’s father, would buy an inexpensive tract of land on the side of Dirkin Mountain, and turn it into a golf course. Which brings us to that Saturday afternoon. At that moment, I wasn’t sure I’d ever play golf with Earl again. Or if I would play again at Dirt Mountain. Why not go for the green on number 6? I’d tried before and had never made it. I teed up my Titleist. After a deep breath and a slow backswing, I launched the shot. I knew right away the line was good. It was high enough. The ball cleared the tree, bounced a couple of times, and stopped on the back edge of the green. Leaving me an uphill 30-foot putt for eagle. One thing about my buddy Earl. He doesn’t like being outdone. If I hit a good shot, he has to top me. Of course he was going for it too. He went through his usual pre-shot routine. Two waggles, a head tilt, then a mighty swing. The line was perfect, the shot was well struck. But too low. The ball bounced off of Becker’s Oak, and began rolling back down the hill. Earl lost interest in his shot a moment later. There was a mighty cracking sound, followed by a giant, earth shaking thud. When his ball hit the tree, just below a massive, rotted out branch, it was the straw that broke the camel’s back. After the branch hit the ground, we could feel it under our feet, over 200 yards away. Samuel Colt had been producing the 1851 Navy Revolver for a number of years before the start of the Civil War. It was a weapon of choice for Confederate soldiers. Later it was carried by men like Wild Bill Hickok, and John Wayne’s character, Rooster Cogburn. The rusty mass protruding out of that oak branch would never fire again, still it was a sight to see. Private Amos Becker was long gone, but the tree had grown around and protected the very tangible piece of evidence he left behind. We got in the cart, rounded up George and a chain saw, and headed back. While they were deciding the best way to cut the gun out of the branch, I remembered I had an eagle putt up on the green. I tried to talk Earl into walking up with me to witness the shot, but he was having none of that. I was on my own. Just as I struck the putt, George pulled the cord on the chain saw. As the ball rolled into the hole, for the only eagle I ever made on a par 4, the roar of a 2 cycle engine drowned out my victory yell. You can see a number of interesting items in the glass counter at the Dirt Mountain pro shop, next to the golf balls and candy bars. There is a 1964 Georgia State Amateur championship medal.That belongs to George. There is a ball with Arnold Palmer’s autograph. That is Earl’s prized possession. And embedded in a chunk of southern red oak, is the ghost of Amos Becker. Learning new golf terms every day :) Must have been awesome to find a piece of history just lying there while you're paying golf. Good. You'll need to be able to talk to the golfers about their game when you drive the beer cart. The Best Bedtime Story Ever! This page was created in 0.3262 seconds.